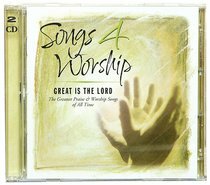 The latest in the immensely popular Time Life Songs 4 Worship Series, GREAT IS THE LORD offers 22 songs on two CDs for just $29.95. These classic worship favourites from artists like Don Moen, Michael W Smith, Ron Kenoly and Twila Paris proclaim the awesome power of our mighty God. About "Great is the Lord (#05 in Songs 4 Worship Series)"